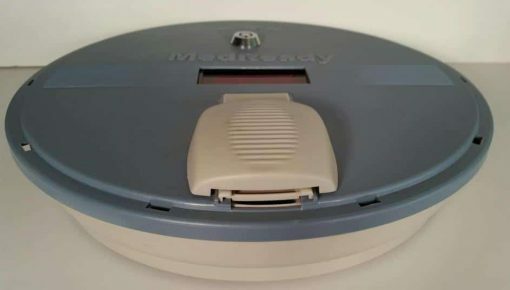 MedReady 1750 Free Shipping (Land Line Monitored) | MedReady Inc.
SKU: 1750. Categories: Medication Dispensers, Monitored Medication Dispensers. Tags: Dispensers, Pill Dispenser. This 1750 MedReady comes standard with the Lower Frequency alarm which from our experience is much easier to hear. The MedReady 1750 series communicates via Plain Old Telephone Service (POTS) to MedReady’s servers. When medication is ready the unit will sound a Buzzer to notify the patient that the medication is ready. Opening the medication door disables the alarm. In the case of a medication non-compliance event the dispenser signals MedReady’s servers and then our servers email, send text messages, and place automated phone calls to caregivers alerting them of the non-compliance event. The complete compliance log can be viewed via the compliance website. There is a small monthly monitoring fee. Please call MedReady at 310.328.7557 for more details. This dispenser holds up to 28 doses of medication and can dispense up to 4 times per day. Each dispensing compartment can hold up to 9 M&M size pills. 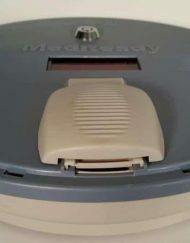 MedReady 1750 Package comes complete with A/C Adapter, Rechargeable Battery, Medication Tray, Blue Locking Lid, 2 keys, telephone cable, and loading rings for 3x and 4x per day dosing. This dispenser holds up to 28 doses of medication and can dispense from 1 to 4 times per day. Currently the monitoring for these units is only available in the United States and Canada, however our cellular devices (MR-357) work worldwide. As a nurse, one of my responsibilities is filling med boxes. A couple of my patients have this particular dispenser. I have been filling these for about 8 months and they are excellent. There have been no serious problems and the patient and the family members feel secure and sure that their mother is getting the right meds at the right time. 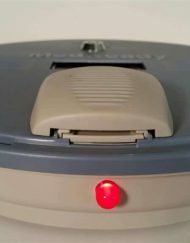 I have been using the MedReady 1750-Modem for about a year now, and have become totally dependent on this system. My patient, who is in the middle stages of Alzheimer’s, still to this day remarks on how much he likes this dispenser. 1. Prevents my patient from overdosing. 2. Makes it easier for me to keep up with what needs to be taken by allowing me to dose out medication up to 28? days in advance. 3. Gives me peace of mind by being able to look at an internet report telling me when the dispenser slot was opened, and by receiving a phone message when the dispenser slot has not been opened after a designated time set by me. 1. Ensure that your patient has actually swallowed the medication. -I am very grateful to this company for selling this wonderful product!